If you’re visiting southeastern Utah make sure you visit Canyonlands National Park. 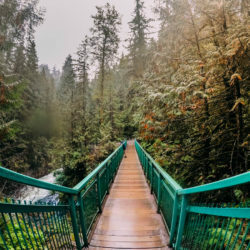 It’s one of many US National Parks that I’d never heard of before our 3 month USA road trip but it was one of my favourites due to the sheer vastness of the scenery. 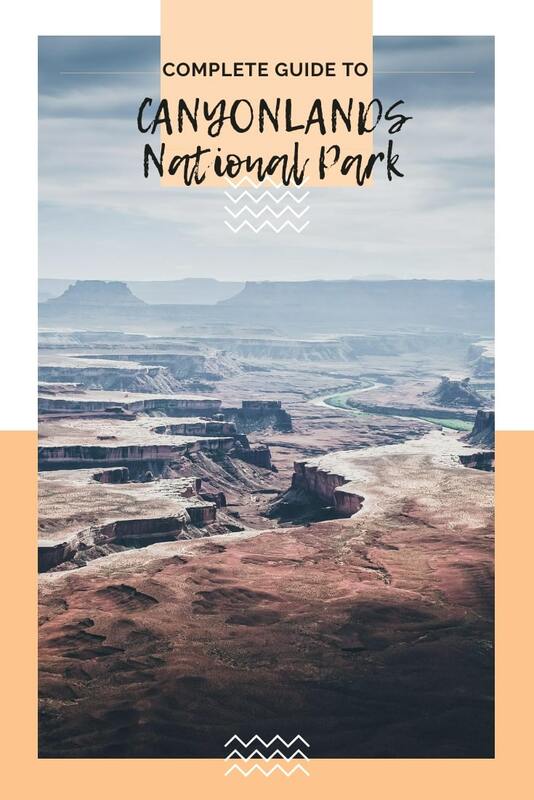 To help you navigate this massive National Park, here’s the ultimate guide to Canyonlands National Park including what to see, where to hike and where to stay nearby. 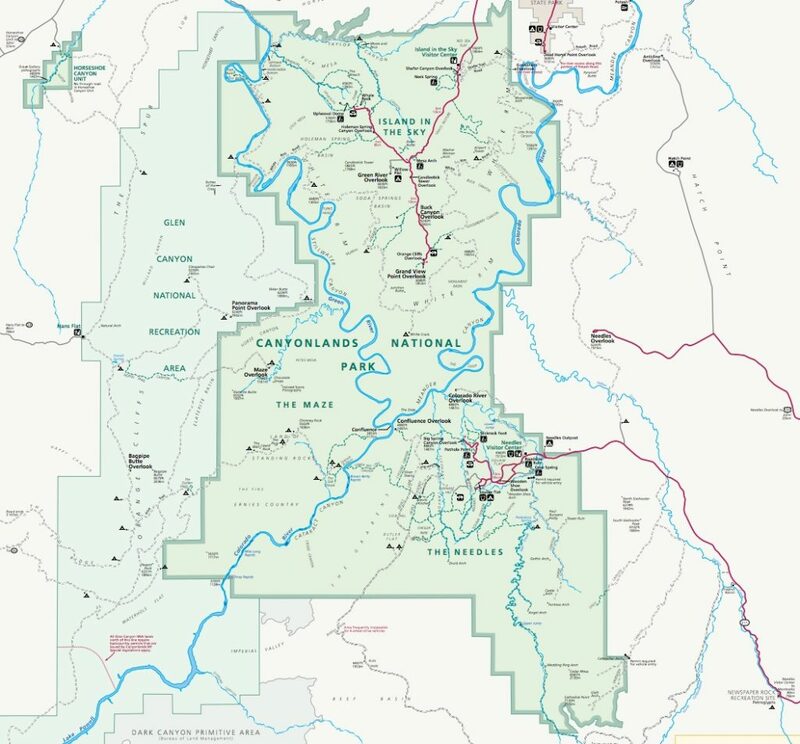 What are the Canyonlands districts? Want more Utah travel ideas? 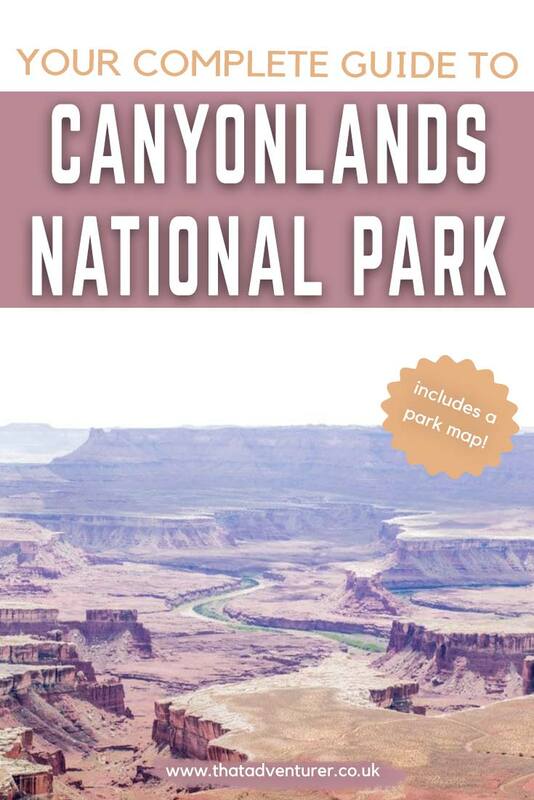 Canyonlands National Park is just one of the many Utah National Parks (see this Utah parks map). 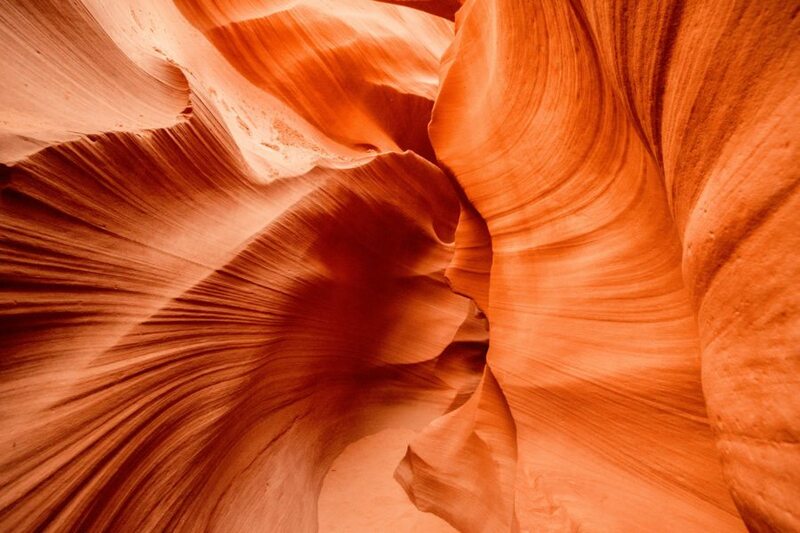 It’s 337,598 acres of colourful canyons, mesas, buttes, fins, arches, and spires and rivers in southeast Utah’s high desert. It’s close to Arches National Park but the scenery is very, very different. The park is split into four districts and Horseshoe Canyon. All these areas are divided by the Green and Colorado rivers. You’ll find desert atmosphere in each district, but they’re all different too in their own way. Because of the fact they’re divided by rivers and canyons, getting to and from each district can be difficult. 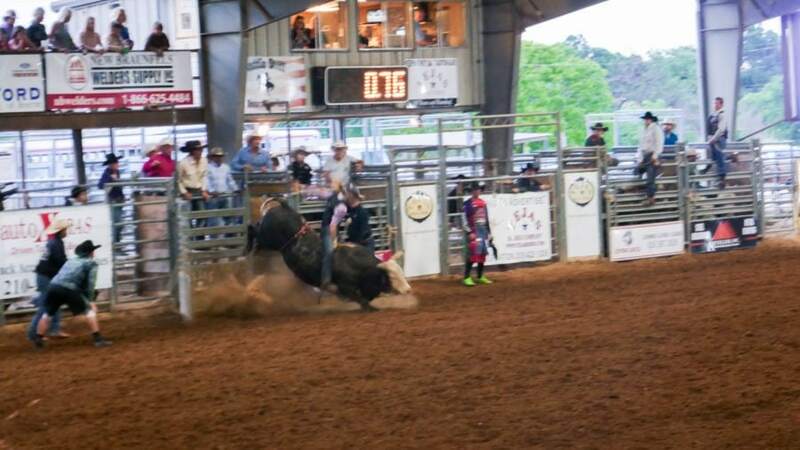 You can’t get from one to other from within the park. You need to go back out the park and drive around it to get to another district. 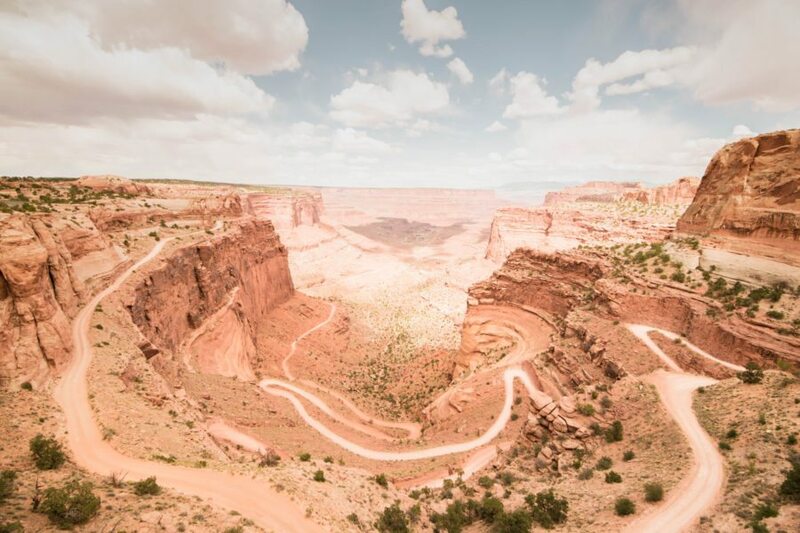 Because of this, it can take 2 – 6 hours by car to get from one district of Canyonlands National Park to another. The Canyonlands National Park entrance fee is $30.00 per car, or $15 per person with no car (i.e. if you’re cycling or hiking in). You can also get a Southeast Utah Parks Annual Pass if you’re planning on visiting lots of National Parks in Southeast Utah for $55. The best deal, however, especially if you’re visiting several American National Parks or are doing a USA road trip, is to get the America is Beautiful National Parks Pass for just $80. This lasts a year and will save you so much money on a road trip! Overnight backcountry permits: Anyone planning an overnight trip into the backcountry must have a backcountry permit. These permits cost $30. You do not need to reserve in advance, but it’s recommended for the more popular routes. Horseback Riding: Horse riders require a permit for Canyonlands too. Day use permits are free, and overnight ones cost $30. If you want to stay at a ‘proper’ campsite check out these Canyonlands camping sites. Otherwise there’s hundreds of backcountry camping for which you’ll need a permit. Here’s an overview of Canyonlands National Park, its districts and what’s nearby. The four districts of Canyonlands National Park are; The Island in the Sky, The Needles, The Maze, The Rivers and The Horseshoe Canyon Unit. This district of Canyonlands is a mesa which rests 304m above the canyon below. It’s the most accessible district and therefore tends to be the busiest. It’s also easy to navigate as there are lots of pullouts and a great paved, scenic drive. The Needles is in the southeast corner of Canyonlands National Park. It gets its name from the colourful rock towers of Cedar Mesa Sandstone that are all over this part of the park. The Needles has hundreds of miles of hiking trails that are perfect for long day hikes and overnight trips. If you have a 4×4 there’s also a lot of opportunity to drive the dirt roads to beautiful areas such as Confluence Overlook, Elephant Hill and Chesler Park. Full list of hikes in the Needles district here. 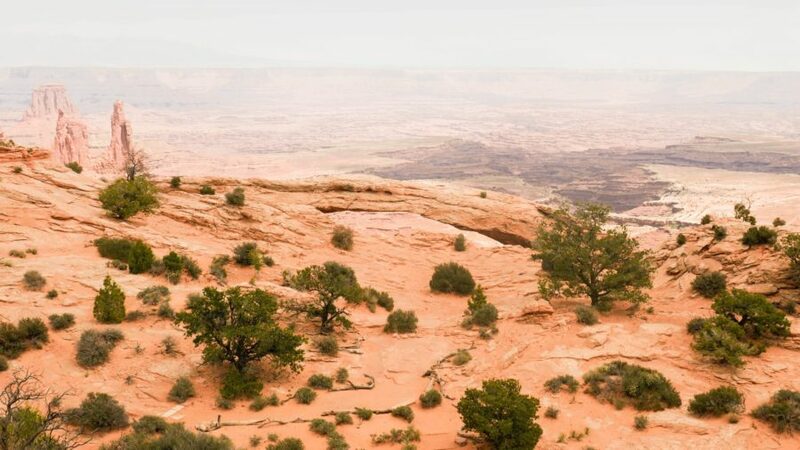 The Maze is the least accessible district of Canyonlands, Utah. If you want to visit this area of the park you’ll need to have plenty of time, be well versed in the back country and carry sufficient equipment and gear for self-rescue. It’s unusual to spend less than 3 days in the Maze, Canyonlands. Whilst there is plenty of backcountry hiking to be done in the Maze, it’s very difficult and you’ll need a 4×4 to get to most of the trailheads. If you don’t have a 4×4 you can park at the North Point Road junction and hike 15 miles to the Maze Overlook. The Colorado River and Green River both go through Canyonlands and create the canyons the park takes its name from. Both rivers are beautifully green and full of life. Upstream from The Confluence, both rivers are calm and are good for canoeing or kayaking. Below this the rivers get fast and powerful. Getting to the rivers is pretty difficult but there are some launch locations. These include Green River State Park and Ruby Ranch for Green River and the Potash and Moab ramps for the Colorado River. I wouldn’t recommend heading to The Rivers on your own unless you’re very, very experienced. Instead, you can take a guided tour. These range from half-day trips on the rivers to week-long river expeditions. Not to be confused with Horseshoe Bend, Horseshoe Canyon has some of the most significant rock art in North America. The best known rock art in Horseshoe Canyon is known as the Great Gallery. It has well preserved, life sized figures. There are also beautiful wildflowers in this district in the spring and impressive sandstone walls. There are so many cool places nearby to check out before or after your visit to Canyonlands. There’s isn’t a ‘Moab National Park’ but it’s super close to lots of them! You’re most likely to be either camping near Canyonlands or staying in a hotel in Moab. 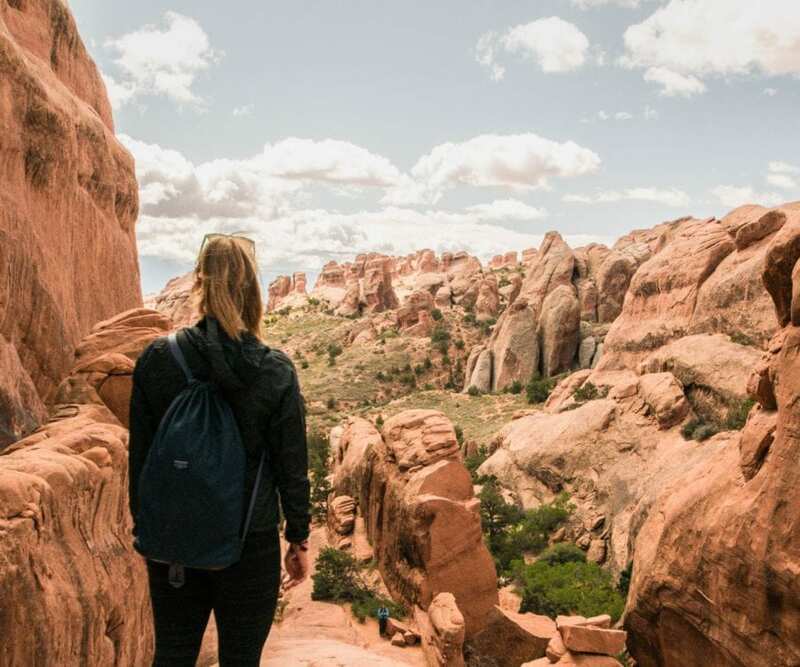 Take a look at my guide to Moab if that’s where you’re basing yourself while visiting Canyonlands National Park. 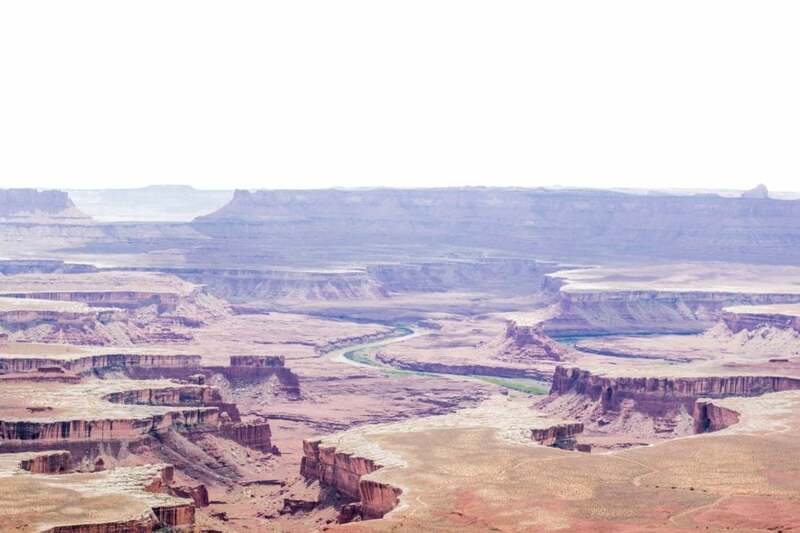 Here’s a few suggestions of top hotels near Canyonlands National Park. If you’re camping in an RV or don’t want to stay within the park then take a look at the following campsites. Archview RV campground has RV, tent sites, cabins and cottages and is the closest commercial campground to the Island in the Sky district. This campground in Moab is within walking distance of the best restaurants and shops in the town. Here you’ll get hot showers, proper toilets and more – luxury camping! Pets are not allowed on hiking trails or on four-wheel-drive roads, even in a vehicle. Leave no trace: Do not enter, alter, damage, or deface archeological sites. Do not collect artefacts. ATVs and OHVs are not permitted. Stay on trails and roads. Drink one gallon of water (4 L) each day it’s hot in summer. However Canyonlands national park weather can cold in the winter and not all the park will be accessible. Remain in one place if you become lost or separated from a group. Canyonlands weather can be unpredictable: flash floods can occur without warning. Never cross a canyon that is flooding. During a lightning storm avoid lone trees, cliff edges, and high ridges. Return to your vehicle if possible. Be careful near cliff edges, especially when rock surfaces are wet or icy.